Bangalore to Thrissur: Garuda Maharaja, RP652 - Again, Again! I was emotionally overcharged. Badly wanted to travel somewhere away from Bangalore. It was another usual two-day weekend, but with a major festival. On a Wednesday, I decide to head out to my home town that Friday. All the travel options for that weekend seemed to be full. After a bit of searching around, I realise that Kerala KSRTC had rescheduled a very useful service to an absolutely idiotic timing - and seats for this bus was available as well. Wasting no time, I book a seat on the first row. Although I wanted a seat on the left side, I managed to get one on the right side. I didn't want to move backwards - a first row seat was compulsory. I had very little options for the return journey - finally ended up flying Air India on Monday (more on that later). 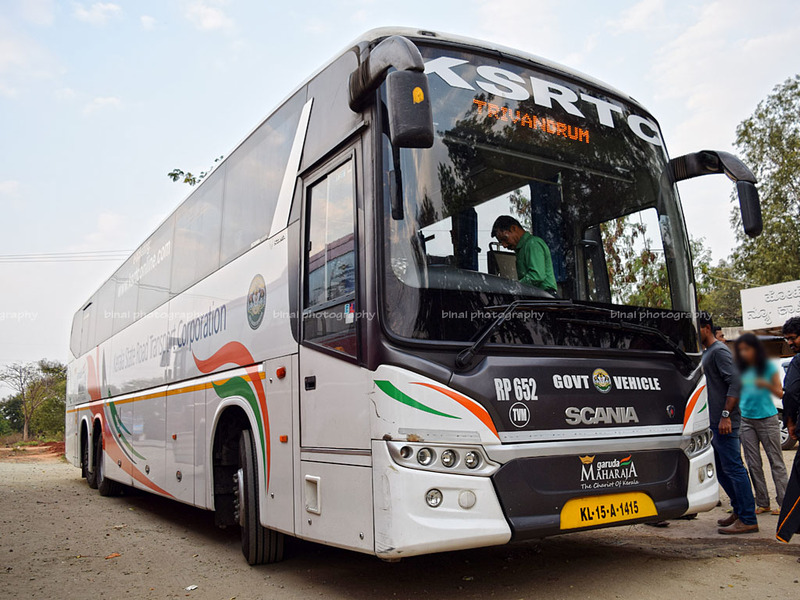 Kerala SRTC has a fleet of 18 Scania Metrolink 13.7m coaches, branded as Garuda Maharaja. Only 2 of them were held in a depot outside Trivandrum - and this bus operated on Alappuzha-Bengaluru route. I had taken this service in December 2016 (read here). Internal politics and incompetence has always been the bane of Kerala SRTC, and has been pushing the corporation from red to deeper red, even more deeper. Internal reasons forced KSRTC to cancel the useful and revenue generating service operated out of Alappuzha to Bengaluru. The service was extended to Trivandrum, and terribly rescheduled. A bus that used to depart at 2000hrs from Bengaluru was rescheduled to 1300hrs. But then, this was a blessing in disguise for me. The terrible timing kept this service on the last among priorities for passengers, and helped me get a ticket on this one. I was quite excited about the first bus journey in 2017 - the fact that it was a "new" service, a KSRTC bus and a Scania bus added to the excitement. I had a hurried lunch from the restaurant at Mysore Road Satellite bus station - this restaurant was recently renovated, was giving a fully new look - but the food had the same old terrible taste. I washed down the terrible tasting food with a lemon juice and rushed to the platform. My bus was already parked there. 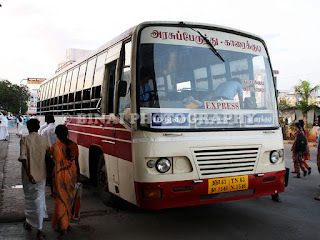 It was the same bus that took me home in December - RP652, now of Trivandrum depot. The conductor was busy checking tickets, while one of the two drivers remained near the baggage hold and helped passengers with luggage (quite an opposite experience to what it was a couple of weeks ago). The bus was full - had over 100 reservations, with certain seats being reserved in 3 sectors! The conductor verified the passengers' name with the identity proof, and just checked if a physical ticket or the mTicket was with the passenger and let people inside. The afternoon peak traffic delayed our departure a little, as a lot of passengers were yet to turn up. We finally started off from the bus station at 1315hrs, 15 minutes behind schedule. Traffic had no mercy on us, and we crawled out of the bus station. One passenger had missed the bus, and requested the crew to stop outside a nearby metro station - but some information was misunderstood by either of the parties, and the passenger couldn't make it. We waded through traffic and made it to Kengeri by 1343hrs. We picked up pace once we passed Kengeri - but the traffic remained on the higher side. There were two drivers on duty - both from Trivandrum depot. The guy at the wheels was quite fast, but did controlled overtakes and did not honk much. I dozed off for a while - but the sun was on my side was it was getting a little uncomfortable. To make matters worse, the guy on the aisle seat snored real loud. We passed Mandya by 1513hrs, and Srirangapatna by 1538hrs. I had anticipated a break at Channapatna - since the departure time was 1300hrs, and most people wouldn't have got an opportunity to have their lunch - but we didn't stop anywhere. We pulled into Mysore bus station at 1602hrs. The bus station was chocked entry to exit, and we barely managed some space to park and take in new passengers. A few passengers used the time to use the washroom and also to buy some eatables. We started from the parking by 1611hrs, but it was 1618hrs when we exited the bus station. Buses were parked haphazardly, and traffic controllers on the ground did absolutely nothing to ensure the exit was clear - however, they were very efficient at shooing off our bus, and forcing us to exit, while their own buses (buses operated by Mysore division of KSRTC) were allowed to block the exit and wait until eternity. The odd timings of the bus forced a lot of passengers to reschedule their pick-up point - there were a lot of requests, and the crew had a really tough time finding out passengers and picking them up from different places. We had a pick-up at Nanjangud (1648hrs) as well. A little past Nanjangud, a passenger requested the crew to pull aside, since he wanted to puke - but by the time the crew could stop, he puked inside the cabin itself - on to the door and the step well. The crew had a tough time cleaning the area - bottles of water were poured to wash off the vomitus. The stale smell lingered inside the bus for a lot of time. Unlike a Volvo, the Scania cannot be driven with the door opened - which might have actually helped recycle the air. We pulled into the often dreaded Hotel Coffe Stoppe aka Thalassery Hotel a little before Gundlupet at 1721hrs. The crew requested the hotel staff to help us with cleaning the bus, which they obliged. My previous experiences with the hotel isn't great. However, following a recent slew of complaints, the rates of food products seem to have reduced - I had a fairly heavy snack of two Kerala Parottas (Layered bread made of refined flour), a vegetable dish and a tea, and it cost me only around Rs. 60. The crew get good treatment there, and their food is free of cost - which is the driving force to select restaurants. We were joined by a couple of other buses at the joint. We started off from there at 1747hrs. By now, the conductor's phone was ringing relentlessly - our scheduled arrival time at Sulthan Bathery (about 60kms away) was 1745hrs! And quite interestingly, a bus that left 30 minutes behind us overtook us while we were at the hotel - the insult doesn't end there! We entered the forest section at 1809hrs. The conductor doubled up as a guide, and was calling out spottings - we spotted a few deers and a couple of elephants on the way. The driver was quite fast inside the forest - he missed quite a few speed breakers. Passengers at the rear would've surely had a bad time. We entered Kerala state by 1837hrs and left the forest by 1845hrs. It got dark by the time we left the forest. 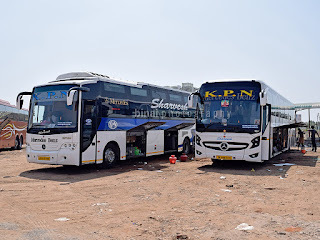 The bus had to go to Sulthan Bathery bus station to refuel - generally multi-axle buses do not go to the bus station, since the entry route is very poor, and these premium buses find it difficult to enter the road. In order to head to the bus station, the driver took the bus to the town centre at Chungam (1905hrs), created a mini traffic block as we turned around, and then traveled in the opposite direction to head to the bus station. We reached the bus station by 1912hrs. After dropping passengers, the bus headed straight to the fuel station. The faulty fuel tank design meant they had to refuel both the diesel tanks seperately and ate into our time - we finally started off from Sulthan Bathery by 1929hrs. The second driver had taken over now - this was an aged guy, quite rash at the wheels. He was soft spoken, and behaved were politely to passengers, though. We were terribly behind schedule already - we had to be at Kozhikode by 1930hrs according to the schedule - a paltry 75 minutes to cover over 98kms, with a fair portion of ghats in between! I am sure the guy who wrote this schedule was smoking something real bad! Passengers waiting en route had no mercy on the conductor, and people released the choicest of their words at the crew - who expressed their helplessness, and replied politely that we are 100kms away, and would take no less than 2 hours to reach Kozhikode. We had a pick-up at Kalpetta (2013hrs). I had dozed off for a while in between, and got up just as we were about to commence descending the Wayanad pass. The bus handled the 9 hairpin bends with ease - the rear steerable axle really helped. I felt the braking a little uncomfortable, and the driver was throwing the bus around at corners. Thankfully nobody puked - but it was surely nauseating. Maybe being on the first row helped me, since I was well prepared to handle the curves. There was no traffic on the ghats, which helped us not prolong the delay. A little past the ghats, a passenger came and requested the crew to stop the bus at a place between Adivaram and Thamarassery, where the bus wouldn't normally stop - although the crew expressed their displeasure about the delay it would cause, they obliged the request when the realised there was a female passenger as well. We dropped the passengers at West Kaithapoyil at 2109hrs. We reached Thamarassery at 2123hrs. There was a request from a girl traveling along to stop at a place before Kozhikode - the crew ensured that there was someone to pick-up the passenger and that the bus stopped at a well-lit place. It felt really good about the crew when they took that extra care about females traveling alone. Traffic was messy once we entered Kozhikode town - although there were no blocks, people seemed to drive recklessly and the driver had to make sudden halts at two places - both the times when car drivers jumped into our lane without a signal or warning. We reached Kozhikode bus station at 2206hrs - over two and a half hours late. There was a lot of confusion here. One, the bus was late, Two, the same bus number was informed to passengers waiting for another bus. A lot of passengers ganged around the bus - but none of their tickets featured in the reservation chart. The conductor had a tough time sorting out the passengers. After majority of the reserved passengers boarded, the conductor went to the station master's office to report absentees - the overcautious station master personally verified each absentee by calling up the passengers and confirming that they weren't traveling. We finally started off from Kozhikode at 2232hrs - over three hours behind schedule. Quite unusually, the driver took the city route to get to the highway, instead of taking the Mavoor road and entering the bypass straightaway. I was too tired and slowly drifted asleep. In the mean time, the driver and conductor were planning to have a dinner break. I slept for quite some time, and woke up only as the lights inside the coach were turned on, and the crew called a break (0004hrs). The restaurant guys also got into the bus and shouted loud - loud enough to wake up anybody who might have been sleeping. Although I was half asleep, I was quite hungry and got off to have dinner. It took me a while to understand where we were - we were a little past Kuttipuram, closer to Edappal then. The hotel was quite quick - it seemed more like a make shift facility than a regular hotel, though. The food was fairly good. We started from there by 0020hrs. I didn't want to sleep after that, and pulled up my back rest. I had my eyes on the road ahead now. The driver was quite rash - he didn't quite bother about oncoming traffic as he overtook vehicles one after the other. The bus didn't seem to be quite well kept - there were too many rattles. At one point, we got into a competition with a Super Fast bus that was going towards my hometown - but I was too tired to get off this bus and get into that. 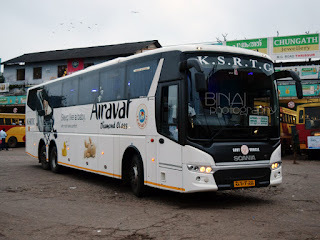 The bus stopped to drop passengers at Perumbilavu (0040hrs) and Kunnamkulam (0048hrs) - unlike my immediate previous experience on the Garuda Maharaja, the crew on this bus didn't make too much of a fuss when people requested to be dropped at places where there was no stop. We finally entered Thrissur bus station at 0113hrs - a good three hours and 13 minutes behind scheduled time. And, the Ernakulam deluxe bus which left 30 minutes after us from Bangalore was already standing at the bus station! Although the bus was late according to the advertised schedule, a bus taking the Mysore-Kozhikode route would actually take this much time to reach Thrissur, from Bangalore. Closing remarks: The bus had about 1.59lakh kms on the odo, and the maintenance seemed quite poor. There were quite some audible rattles this time. Although this particular service came to my rescue at this peak season, I am quite opposed to spoiling a good service to satisfy egos and internal politics. Terrible timings and unreliable advertised schedule would only add to the misery. The crew were quite good in their behaviour to passengers, and I appreciate the extra measures they took to ensure safety of women passengers. Driving was very so-so - the second driver was outright rash, while the first guy was kinda passable. The unbelievable schedule was a big dampener in the overall experience. I really wonder what stuff was the guy smoking when he prepared such a schedule. Overall a very mixed experience with this service. Entertainment: Available - Movie played. Will I take this service again? Hell no! Unless I am on some "time-wasting" journey. Might be a good option for Kozhikode passengers, though.